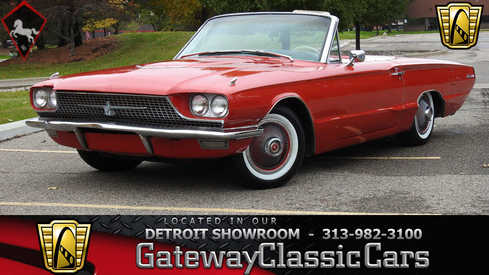 General description : For sale in our Detroit showroom is this stunning 1966 Ford Thunderbird Convertible. 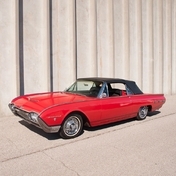 The fourth generation of the Thunderbird which was designed as a large personal luxury car was produced from 1964 through the 1966 model year. This generation of Thunderbirds was restyled to favor a more squared off formal look as opposed to the previous sporty image that had been portrayed. 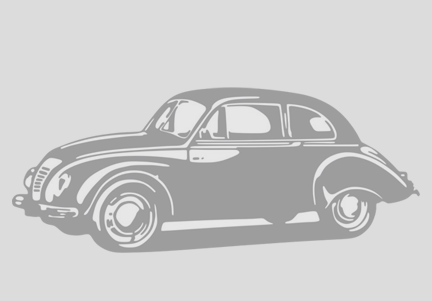 The standard 390 cubic inch V8 engine had 300 horsepower and could reach a top speed of about 120 mph. This 1966 Thunderbird is a very original display of the classic Ford model retaining the correct drive train as well as the original factory interior that looks as it did back in the day it was built. The original power train in this beauty is the 390 cubic inch V8 engine which was rebuilt and has less than 200 miles backed up by the 3 speed automatic transmission which still shifts smoothly throughout all of the gears regardless if you are on a leisurely cruise or hammering on the gas using the big V8’s full potential. 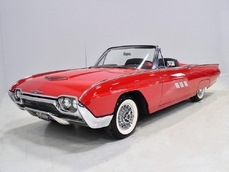 This 1966 Thunderbird convertible has a beautiful look with the shine of the bright red gloss of the exterior that is perfectly matched with the white leather interior. 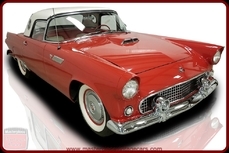 As you look into the interior of this Thunderbird you will notice how spacious and luxurious it is and being beautifully accented with the brilliant shine of chrome that compliments the deep red color of the carpet. This stylish Ford is ready to spend its weekends with the top down as it sends the warm breeze of the summer air flowing through the interior and giving you and your passengers a feeling of excitement and freedom as you are out for a ride around town. 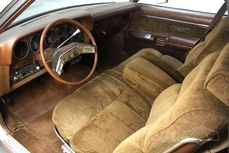 This stylish convertible Thunderbird is nicely equipped with an AM/FM radio, power steering, power brakes , power windows, power locks, power seat, power convertible top, leather interior and hub caps with white wall radial tires. To view this stunning 1966 Ford Thunderbird convertible in greater detail including over 100 HD photos and video, please visit http://www.GatewayClassicCars.com or call to speak with one of our friendly and knowledgeable staff at 313-982-3100. 1966 Ford Thunderbird 390 CID 4BBL V8 is listed for sale on ClassicDigest in Dearborn by Gateway Classic Cars - Detroit for $16595.